Motors and transformers are some of the most reliable pieces of equipment installed at power plants. However, inadequate maintenance can result in trouble. While regular testing and skilled evaluation can help catch problems before equipment fails, new technology is also available that allows real-time monitoring and performance trending. It is true that electric motors and transformers are some of the most dependable pieces of equipment installed at power plants. They can, in many cases, withstand a high level of mistreatment while continuing to operate reliably. It is for exactly that reason, however, that the equipment often does not receive the maintenance attention that it deserves. When electrical equipment fails, it usually does so quickly and catastrophically. Doug Ostafichuk, product line leader–motor and generator repair services for GE’s Industrial Solutions business, likened motor condition to the health of a person. 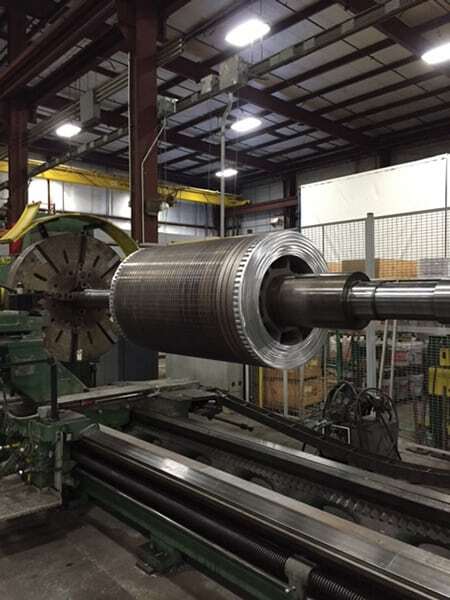 He said a well-treated and maintained motor is likely to operate continuously and reliably for a long period of time, but treat it poorly or abuse it, and although it may not immediately show outward issues, its life and performance will be degraded. 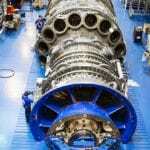 Although many power plants have extensive motor management processes in place, there are still some facilities that don’t. Often, budget limitations are the problem, but Ostafichuk suggested that there are some simple steps that a plant can take to improve reliability without breaking the bank. To get started, a risk analysis should be conducted on all operating motors to determine which machines are critical to plant operation. Once identified, baseline data should be collected to determine current condition and to identify if any immediate repairs are warranted. Thermography—which tends to be underutilized—can detect problems such as failing bearings, misalignments, dry couplings, high resistance, loose electrical connections, and phase imbalances. Measuring vibration intensity can provide valuable information about alignment and balance, condition of bearings, and the effect on the machine of resonances from housings, piping, and other structures. Both tools offer effective, nonintrusive methods of monitoring motor condition. The most successful plants go beyond these two monitoring techniques to ensure the health of their operating motor inventory. Ostafichuk suggested that employing some of the following processes could be part of the next step. Appoint a “Motors Champion.” Identify and assign a person to manage the motors program. The individual should be tasked with ensuring that proper operation, maintenance, and service practices outlined by the original equipment manufacturer (OEM) are followed. Procure an Inventory of Spares. 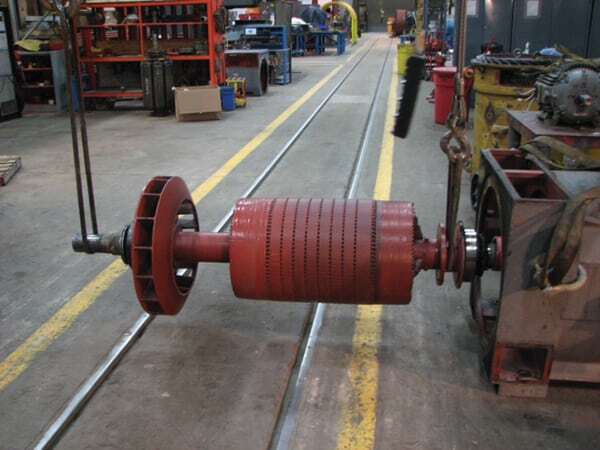 Maintaining an inventory of spare motors for critical machines allows non-emergency maintenance of offline equipment. This can be coupled with a predictive maintenance system to ensure refurbishment is planned and carried out at optimal intervals. Conduct Periodic OEM Inspections. 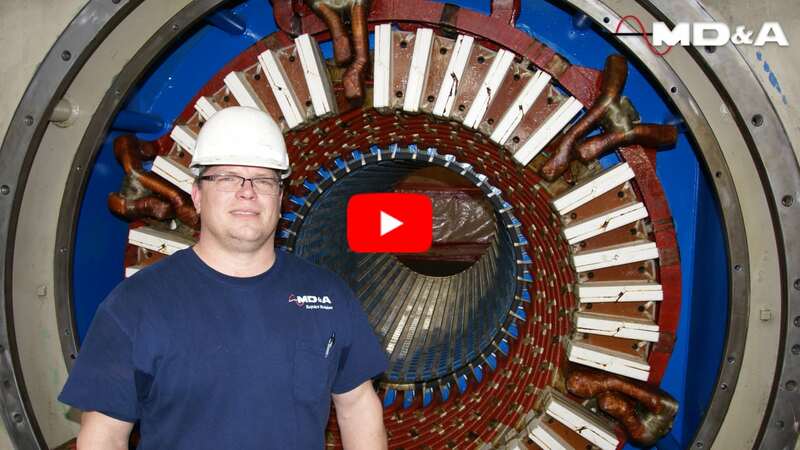 It is important to have OEM engineers or maintenance specialists inspect important motors. The experts usually have a detailed understanding of the design, access to a vast historical database, the ability to recognize problems based on experience with like equipment, and they can identify what performance and reliability improvements have been added since the machine was manufactured. Operate within Design Specifications. Confirming that equipment is being operated within the original design expectations can pay dividends. Damage to insulation and components may not be immediately apparent, but it is a proven fact that machines operated beyond design conditions do not last as long as machines run within operating parameters defined by the OEM. Maintain Adequate Cooling Airflow. Motors and generators create a lot of heat that must be dissipated to prevent damage to machine components. Operators should ensure that clean, uncontaminated air is flowing through plant motors. In humid climates, the air should be conditioned and space heaters should always be turned on when machines are turned off to prevent condensation. If particulate concentration in the air is heavy, proper filtration must be used and maintained. For machines with totally enclosed air-to-air cooling or totally enclosed water-to-air cooling systems, the condition and performance of the cooler must be monitored and maintained. Contamination of the cooling medium is a major cause of premature motor failures. The easiest way to determine how oil-filled transformers are performing is to track oil quality and gassing. When a transformer’s insulation system is overstressed, gases are produced that dissolve in the oil. By analyzing the dissolved gas in the oil, developing faults can be identified. At a minimum, annual oil sampling should be conducted for this purpose. Most oil testing companies offer trending services for their customers and can point out potential trouble as it arises. 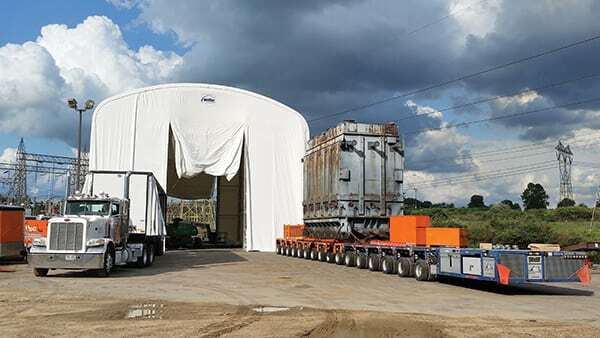 John Engstrom, senior product and sales leader—transformer services for GE’s Industrial Solutions business, said that there are monitoring systems available today with the ability to measure moisture in oil, combustible gases, loads, and temperatures. One example is GE’s Kelman TRANSFIX transformer gas analyzer, which can measure nine gasses and moisture; it also has sensors for various other inputs. These systems can be expensive ($40,000 or more), so they are mainly installed on generator step-up or other large, critical transformers. Another example is Siemens’ transformer monitoring and diagnostic system (TMDS). 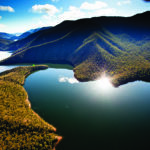 An expert from Siemens Asset Services business told POWER that the TMDS system combines a variety of engineering models with advanced techniques of statistical learning to go beyond simple condition measurements with prefixed limits. The system (Figure 1) turns the data into actionable information by translating combustible dissolved gas, bushing capacitance deviation, moisture, and other sensor measured data into diagnostic and prognostic messaging. Smaller, less-complex systems are available to monitor noncritical transformers. GE offers the Intellix GLA100, which continuously monitors hydrogen gassing only. Hydrogen is generated with low-intensity discharges such as partial discharges and very-low-level intermittent arcing. With this system installed, however, it is still important to conduct annual oil sampling and infrared testing to ensure no problems are being overlooked. In general, transformer manufacturers recommend testing transformers every five years. 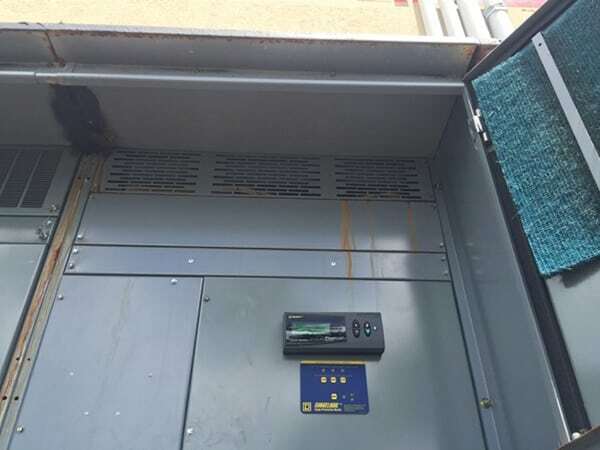 Frankly, if there are no issues with gassing or degraded oil quality, there isn’t much reason to test transformers outside of occasional infrared testing, which can identify hotspots caused by loose electrical connections or inadequate shielding. 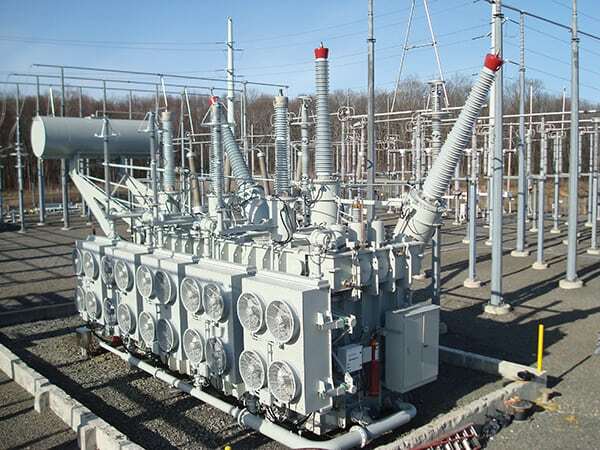 But if a transformer is taken down for service, some things that can be checked include the transformers’ insulation resistance, power factor, and sweep frequency response analysis. Baseline data can be useful for trending purposes. Engstrom said that many plants also perform a turns-ratio test, but he considers it virtually meaningless because the transformer won’t operate with shorted turns. Some type of system event causes most problems identified through testing. A generator surge, a lightning strike, or a bushing failure can all trigger transformer problems, but even more obscure things, like harmonics, can result in damage. Engstrom said low-voltage testing can identify problems caused by these types of events, but there are cases in which high-voltage testing, such as induced testing, may be required to determine if a transformer’s insulation system has been compromised either from damage or from contamination. Portable, flatbed trailer-transported induced testing systems can be brought to transformer sites. These systems completely stress transformer insulation systems in a nondestructive manner to determine if any problems exist. As you can imagine, this is a costly test to perform, so most utilities only perform this test on large or critical transformers. 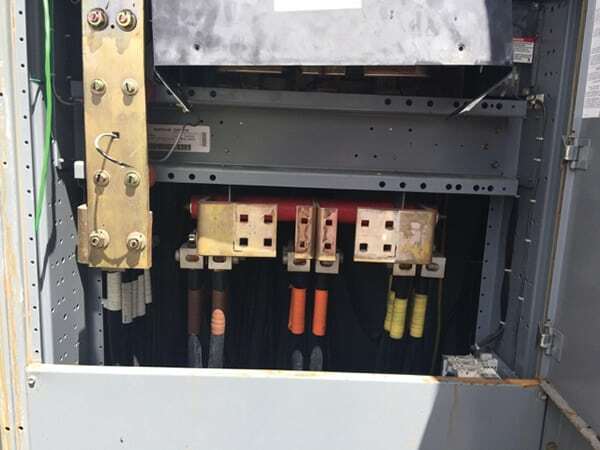 The installation of fiber-optic temperature sensors in the windings is not a new upgrade, yet Engstrom said that most transformers he sees coming in for repair do not have these systems. These sensors provide a more accurate measurement than winding temperature indicator systems that use top oil temperature and simulated winding hot spot temperatures. With more accurate sensors, cooling system devices, such as pumps and fans, can respond quicker to changing loads, which can protect transformers from damage. Most comprehensive reliability programs schedule visual, mechanical, and electrical assessments based on OEM guidelines. Frank Donaldson, power distribution systems technical expert for Schneider Electric, suggested that several important tasks can only be performed during planned outages. Exercising these types of components as part of a plant’s routine maintenance program can increase reliability. Donaldson recalled one example in which a facility was forced to call for emergency assistance as a result of improper electrical maintenance. In that particular instance, a 2,000-amp feeder breaker tripped because of water damage (Figure 2). Although the switchgear was 3R-rated by the National Electrical Manufacturers Association—which means that the enclosures were constructed for either indoor or outdoor use and designed to provide a degree of protection against water ingress, among other things—corrosion had occurred due to poor maintenance practices, which had allowed rain to leak into the component. At the same facility, a downstream bolted pressure switch failed to open as designed because it hadn’t been serviced or operated since it was first installed more than 23 years earlier. In that instance, the contacts seized, causing the operating mechanism to fail. According to Donaldson, the lack of an effective maintenance program resulted in liquidated damages exceeding $1 million in that incident alone. He noted that the environment in which equipment operates is a major factor in determining how often maintenance should occur (Figure 3). As part of any good motor management program, machines should be refurbished at a qualified service center when required. 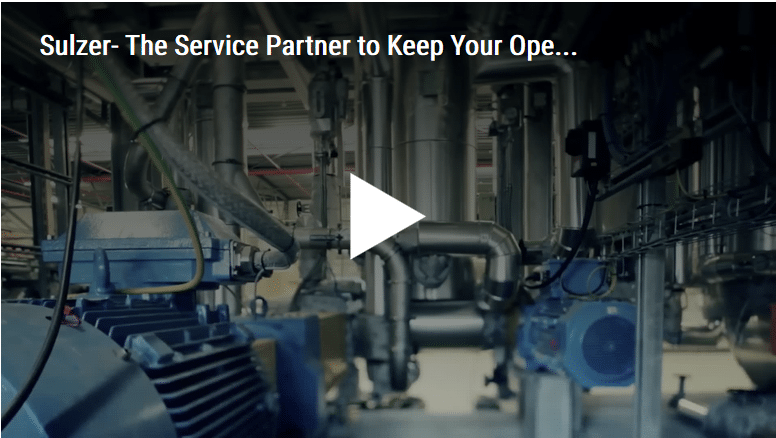 There are a wide range of options available, from single-site “mom and pop” organizations to large, sophisticated repair and service center networks managed by OEMs. Large networks may have more advanced technology, special access to certain drawings, tighter quality control processes, and larger budgets for training and qualification. On the other hand, small shops can have cost advantages and some offer a more personal touch. Ostafichuk said operators should compare offerings and choose the option that suits their service level requirements. The following factors are worth considering. The Service Center. Does the shop have the equipment necessary to efficiently and effectively complete needed repairs? Evaluate the shop’s cleanliness and equipment condition—it is unlikely that repair personnel will treat a customer’s equipment better than they treat their own (Figure 4). The People. Does the company offer continuous training programs to keep employees abreast of best practices and developments within the industry? The shop’s safety and quality control records can help you assess performance. Low employee turnover can also be an indicator that the shop is doing something right. The Processes. Are there tightly controlled methods to track work as it proceeds from initial inspection to final delivery? Electric motors can be similar to “black boxes”; once work is complete, it is not easy to see what was done on the inside. The best way to ensure that proper and accurate repair has been completed is to ensure that suitable documentation has been signed off by technicians who actually performed the tasks, with oversight from the technical staff or engineers responsible for the job (Figure 5). The Proposal. Are you comparing apples to apples? Evaluating proposals from different organizations can be challenging. It is important to ensure that the service, parts, and processes being supplied are comparable. The specification provided must be strong enough that the customer can feel confident in receiving the desired level of service at the expected price without excessive change requests during the repair. It may not be possible to identify every potential problem during the proposal phase, but the repair team should be technically strong enough to recognize the majority of trouble. Large differences between proposals should raise a red flag. The Parts. Where are repair parts sourced? There is a lot of variability in electrical repair components and materials. Qualification and verification of vendors, suppliers, and materials used is a critical factor to a successful repair project. Changing component properties from an OEM design and quality to something different can be an experiment that you may want to avoid. Tom Grace, brand protection manager at Eaton Electrical Sector–Americas, emphasized the importance of purchasing authentic parts. He said that easily more than half of the counterfeit products that he receives and tests have some sort of critical performance failure. “Independent resellers, people outside of the typical manufacturers’ distribution channels, or people who deal in used or reconditioned equipment are typically the ones who find they are more exposed to counterfeit goods,” Grace said. The problem is that fraudulent parts are not held to the same quality control standards. If a motor starter or circuit breaker is constructed using will-fit or knockoff parts that have inferior materials, the risk of failure increases substantially. A starter often controls a more sophisticated motor that is much more expensive than the starter itself, so a failure could cost significantly more than the cost avoided by purchasing a cheaper starter. The same could be said for a counterfeit circuit breaker that fails to trip. It is in everyone’s best interest for the manufacturer to be notified whenever someone discovers equipment suspected of being counterfeit. Most manufacturers have the resources to investigate the fraud and put an end to the activity. In some cases, counterfeiting operations fund some sort of other illegal activities. Grace said organized crime, gangs, or even terrorists could profit from these schemes. “We can’t fix it unless we hear about it,” Grace said. 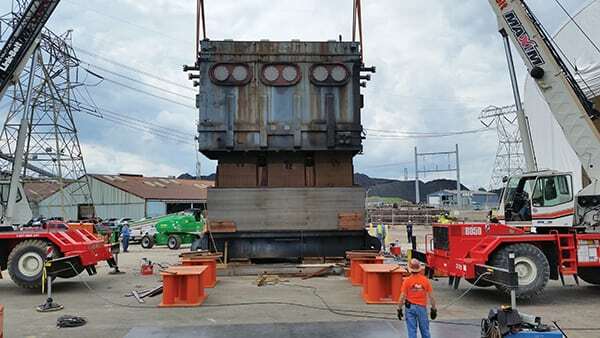 According to Engstrom, GE has the capability to repair transformers from 5 MVA to 500 MVA and up to 525 kV at four facilities located across the U.S. and one in Canada. It can also perform rewinds up to 1,000 MVA at customer sites. The service includes building erection (Figure 6), rigging (Figure 7), disassembly, and performing all required Institute of Electrical and Electronics Engineers (IEEE) testing. — Aaron Larson is a POWER associate editor.